Well, Stella likes what she likes and definitely hates things she dislikes. Since she is getting over this bug the doctor said to make sure she is drinking plenty of fluids. Well, we tried Pedialyte (grape flavored) and at first it looked like she was going to love it...WRONG. She wont even go near the sippy that has the grape greatness in it once she sees me pour it. So We tried Sprite with water. 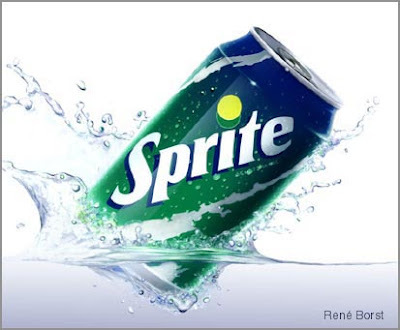 No thank you to Sprite. I don't think she likes carbonation. I guess she takes after her GaGa. Anyway, she is drinking water and her appetite is returning, so things are looking up. And she is back to her normal sleeping routine--she slept 13 hours last night straight. BUT there is some bad news...now daddy is sick. He was up from 12:45-5:30 with an upset stomach. Needless to say, I slept on the couch and now he is quarantined to the bedroom (well, really he's finally sleeping). My new Bible Study started this am, but I had to skip out because I didn't want to expose other kids to it by putting Stella in the nursery and Tom was going to stay with her while I went...well, he got the bug. So I'll just have to wait until next week. 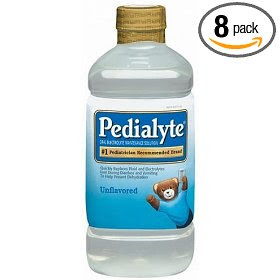 Thanks to those of you with tips on how to get little ones to drink pedialyte. Stomach Bug = No Fun! Maybe Cabin Fever Isn't so Bad!!! !